Give me a super easy, casual ‘Jamie Oliver’ style meal any time…family feasting with great flavours and colour and variety, preferably plonked into the middle of our dinner table, that is big enough to sit adults and kids together and for everyone to help themselves. Fun, laughter, red wine, paper napkins. Bliss. We did this on friday night. 5 kids, 4 adults. One great big pot of Chili Beef, a delicious spinach salad, and for pud, chocolate cake, strawberries and icecream. I was given this recipe last year (thanks Diane!) It was originally ripped out of a magazine, so unfortunately I can’t credit the original creator of this easy, peasy chilli. 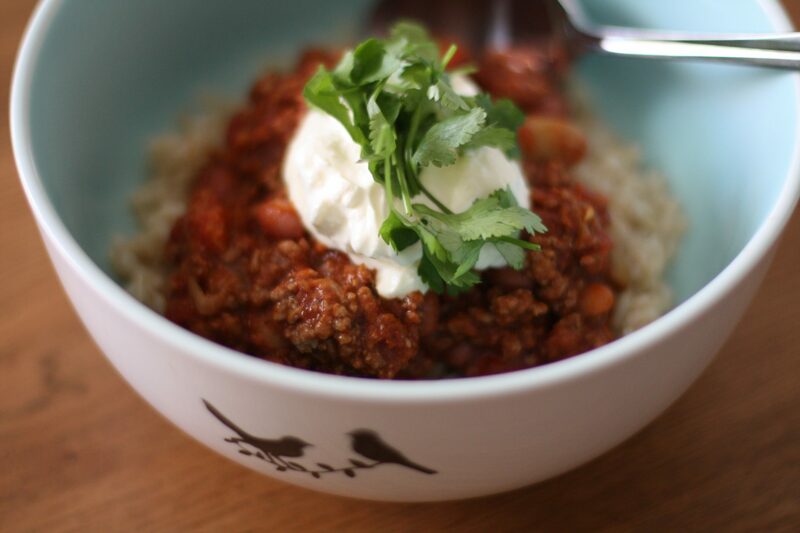 I’m giving you though, the undoubled, untripled recipe…so this one only feeds 4! The kids like it with “Original CC’s” corn chips and Dude and I like it with brown rice. Guess what? You choose. Heat oil in a large pan. Saute onion and garlic for 2-3 minutes until tender. Add mince. Brown well for a few minutes, breaking up the lumps with the back of a spoon as it cooks. Add chilli and herbs. Dissolve the stock cube in the hot water. Add to the pan with remaining ingredients. Simmer, covered, for 15 minutes. Uncover and simmer for another 15 minutes until thickened slightly. To serve as nachos – empty corn chips onto a large heatproof platter. Spoon mince mixture over the top. Sprinkle with grated cheddar cheese. Grill for a few minutes until cheese is melted. Dollop with sour cream and sprinkle with coriander. Eat…with your fingers and a fork…supply plenty of napkins! Previous So…what’s in your camera bag?